When you are installing a new Microsoft CRM 2011 On Premise – a common best practice is to install it on the latest version of the required software (Operating System, Database, etc.). For the Microsoft CRM database – that would be on the Microsoft SQL Server 2012. As of July 2012, according to Microsoft KB Article 2686619 – Microsoft Dynamics CRM 4.0 (Update Rollup 21) and Microsoft Dynamics CRM 2011 (Update Rollup 6) are compatible with Microsoft SQL Server 2012. If you are installing the Microsoft CRM 2011 server on a Microsoft SQL Server 2012 environment – you will need to use the latest Microsoft CRM 2011 installation files that have Update Rollup 6 included. 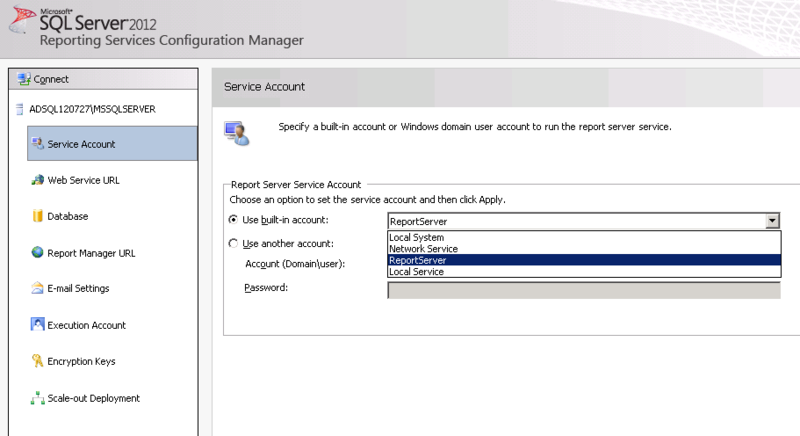 If the Microsoft SQL Server 2012 Reporting Service was installed via default settings – then the service account is set to “ReportServer” – to resolve the issue, open the Reporting Services Configuration Manager and update the Service Account to something else such as “Local System”. Microsoft CRM 2011 Report Authoring Extension is only supported on SQL Server 2008 or SQL Server 2008 R2 BIDS at this time. You will encounter the below error if trying to install the CRM BIDS Report Authoring Extension on SQL Server 2012 Data Tools (SSDT), SSDT includes BIDS functionality. 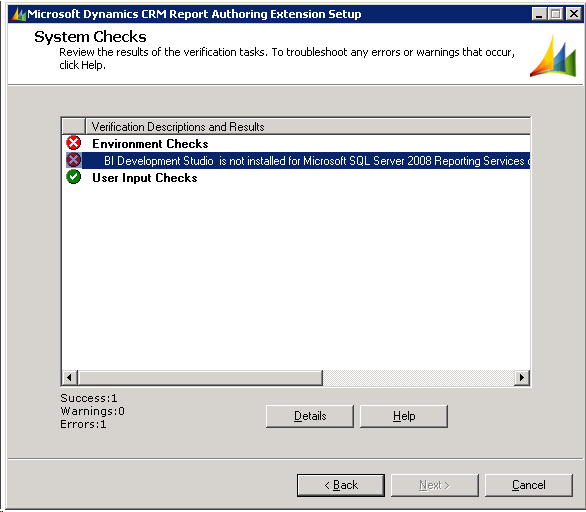 Workaround: Install SQL Server 2008/2008 R2 BIDS on a separate PC and then install the CRM BIDS Extension on this PC – the RDL that it generates is supported on CRM 2011 running on SQL Server 2012. This entry was posted in BIDS Report Authoring Extension, CRM 2011, CRM On Premise, Microsoft Dynamics CRM, MS CRM, ms crm 5.0, Report and tagged SQL Server 2012 Support, The SQL Server Reporting Services account is a local user and is not supported. Bookmark the permalink. 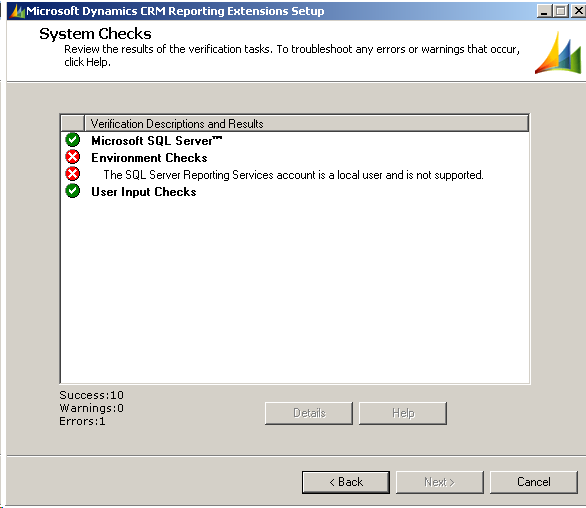 After changing the SSRS service account ensure that you exit and restart the SSRS Data Connector setup to get past the error. Clicking ‘back’ then ‘next’ in the installer will continue to show the error. You could also click back a few times to the beginning of the wizard where it asks for the SQL Server, it will then refresh again. question? i never recieved any CD keys for my installation, and was told that they are “in my installation cd” and that i have to install from my CD. so how could I download the updated install pack to use SQL 2012? ?